Amir Khan captured a silver medal in the 2004 Olympics, he captured world titles as a professional, but he’s never been regarded as a pound-for-pound fighter. 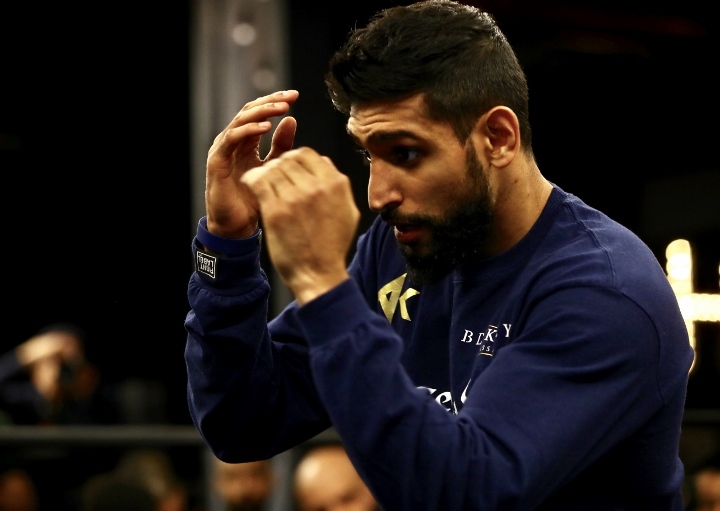 Khan will get that opportunity on Saturday night, when he faces WBO welterweight champion Terence Crawford at Madison Square Garden in New York City. The fight will headline an ESPN Pay-Per-View event, with a three fight undercard. Crawford, who enters the fight as a massive favorite, is also regarded as one of the top pound-for-pound fighters in the world. Khan admits that a victory over Crawford would be the pinnacle achievement of his pro career. “I wanted this fight because I wanted to fight the best. Terence Crawford presented the greatest challenge to me at this point in my career. Listen, the Kell Brook fight was there, but fighting Terence gives me the opportunity to show I am a pound-for-pound fighter,” Khan said. The big question in the fight is Khan’s chin. He’s been stopped three times in the past and dropped numerous times – including in his last fight with Samuel Vargas. “When I lose focus is when I get in trouble. Against Samuel Vargas, it wasn’t even a great punch that put me down. I lost focus for a second and got caught. I’ve sparred with strong, heavy-handed guys this camp, and I know I can take a big welterweight punch,” Khan said.